I am so happy to welcome Heidi from FoodieCrush to our Passover Potluck table. Heidi is a rock star. 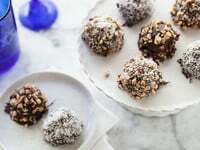 She writes and edits a beautiful blog, as well as a seasonal online magazine called FoodieCrush. Those of us in the food blogging world anxiously await each issue of this popular, beautifully designed mag, which highlights food bloggers and their various seasonal cooking exploits. Heidi is a gifted food photographer, and each issue features several of her gorgeous recipes and photos. She’s also co-authored a terrific e-cookbook called Cookie Cravings, which you should order ASAP (and enjoy after Passover, if you’re observing the holiday). I was so happy when Heidi agreed to join our Passover Potluck, and the introduction she wrote has totally got me blushing… and crushing! I am super excited to make this dessert for our family Seder. Yum! Wow, thank you Tori for inviting me to be part of your Passover Potluck. Honestly, I am more than flattered to be asked and somewhat intimidated at the opportunity since I’ve never actually attended a Passover dinner before. Luckily, I have several good-faithed friends who could lead me on my way through the Passover rules, including of course, the most comprehensive Passover resource in the blogosphere: ToriAvey.com! I first discovered Tori’s blog when doing research on food bloggers to feature on my own blog, where I feature original recipes and those from my food blog crushes, showcasing delicious eats and gorgeous photography. 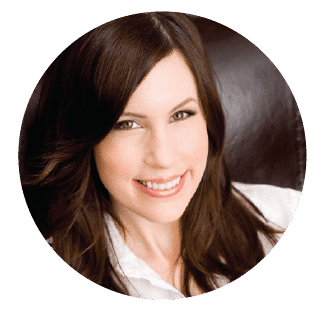 When I discovered Tori’s site I was struck not only by her depth of knowledge about all things Jewish, but also her impeccable taste and her smartly designed site. Bingo, immediate blog crush. A few months later I was so happy to meet her in person at a food blogging conference, where she proved her taste isn’t just in her mouth or on her site, it’s who she is. If you haven’t noticed yet, the girl has it going on. 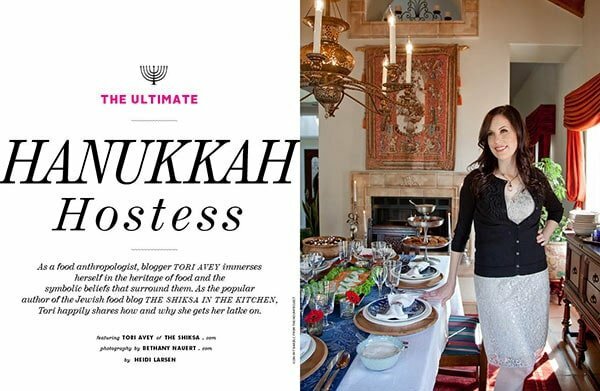 In my last issue of FoodieCrush magazine, Tori was gracious enough to create a Hanukkah, dinner to be featured in the issue. 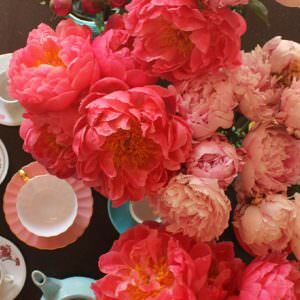 She created an amazing menu—yes, she is the ultimate hostess—that was photographed by the talented Bethany Nauert. It turned out stunningly, not only thanks to her delicious recipes and Bethany’s gorgeous pics, but also due to Tori’s incredible attention to detail. I don’t know if I’ve worked with someone so on top of things. Guess that explains her successes, hard work and diligence. Can you tell I have a blog crush? As a gentile and a novice at the Passover festivities—and I assume there are others of you out there as well—I consulted (okay, pleaded with despair) with one of my devout Jewish friends, Nicole, to help with suggestions on what to create for this post. She had the perfect recipe and even met me at the grocery store to be sure I was picking the right products labeled “Pareve” and not just “Kosher.” As a novice I was a little dizzy with the dietary rules, and because in Utah we don’t have the largest Passover product selection and I hadn’t allowed enough time to shop online, I was thankful I had a pro in Nicole at the grocery cart wheel. 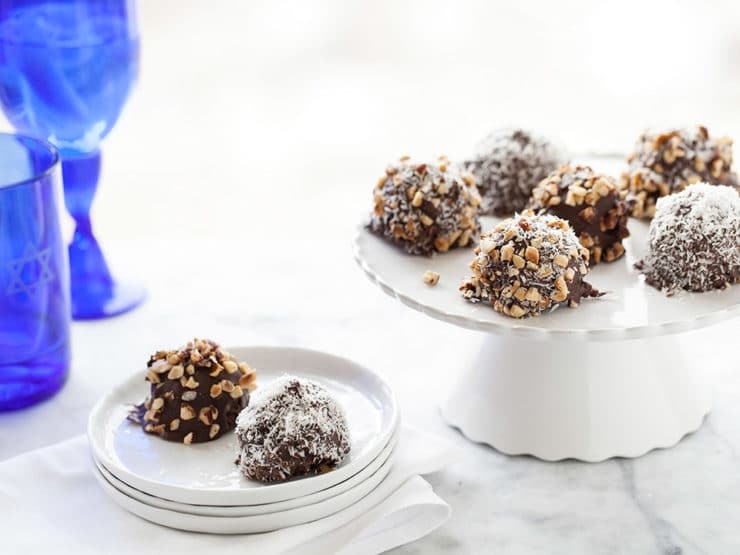 This recipe came from Nicole’s need (okay, let’s be real, her craving) for a tasty sweet ending for her Passover meal but easy enough to bring together for a crowd. Let’s just say there was clamoring for seconds and not a dry taste bud in the house. The recipe can become a little messy but that just makes for some tasty sampling along the way and it’s a great one to include the kids in. 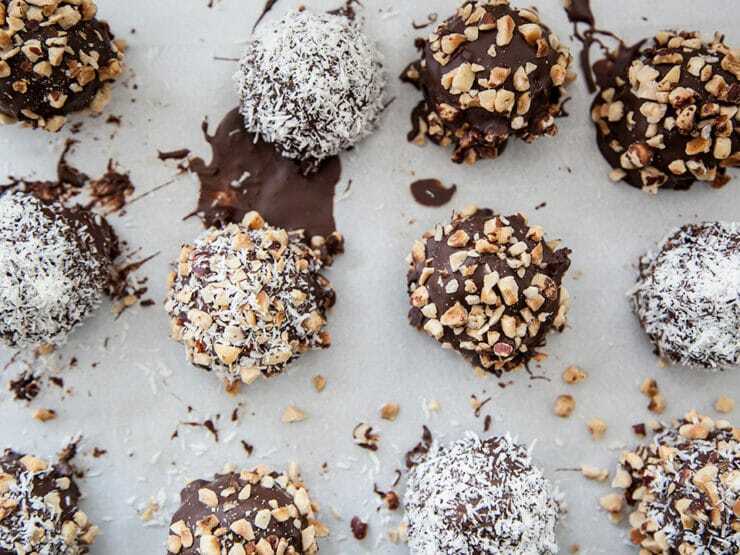 Kosher for Passover cake bites covered in dark chocolate and dipped in chopped nuts, sweetened coconut or any topping you'd like! 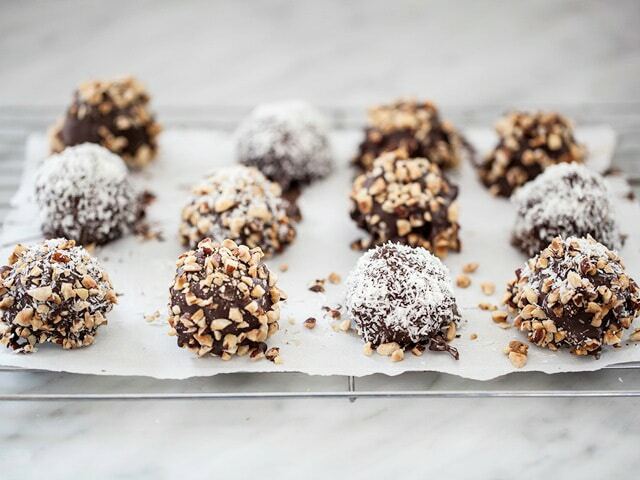 From Heidi Larsen of FoodieCrush. Make the cake according to the package directions. 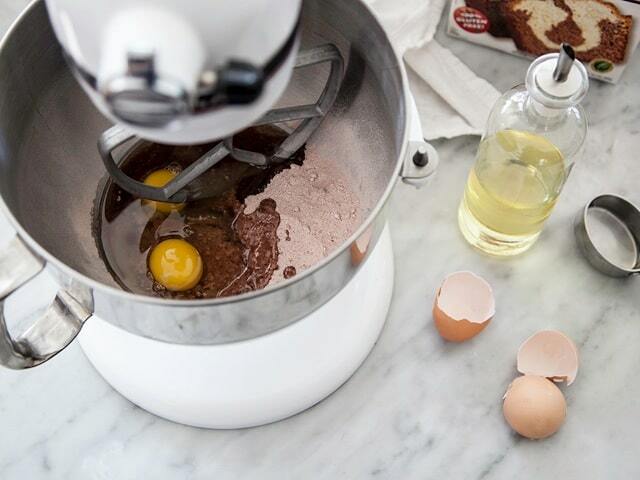 This normally involves the addition of fresh eggs and oil blended with the yellow mix in a stand mixer and eggs and an additional egg and chocolate cake mix blended in a separate bowl. Pour into a 9” X 9” pan, swirl the two flavors together with a chopstick or skewer and bake according to package directions. Allow to cool and then crumble the cake with your fingers into a large bowl, using a pastry blender if needed to create an even crumb. 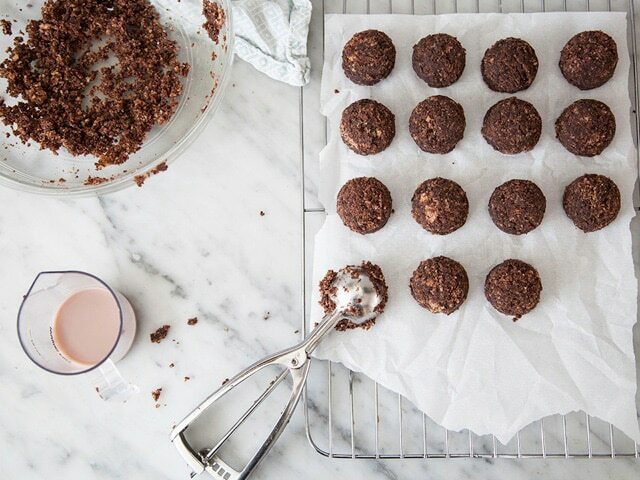 Drizzle with almond milk, starting with ½ cup. Mix with your fingers until the mixture starts to hold together. Add more almond milk a tablespoon at a time, testing the texture until the mixture holds together in clumps and will form a ball. Using a 1-inch scoop, pack the scoop with mix and form the balls, leveling out the bottoms on the side of the bowl. Roll the balls very lightly in the palms of your hands, or just pat down the shaggy edges if you don’t feel like rolling. 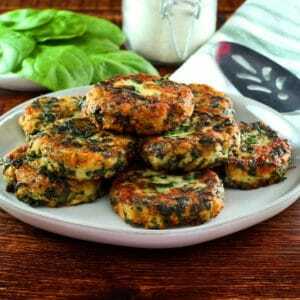 Place on a small baking sheet or plate and freeze for 30 minutes. You can make the balls up to this step and freeze in freezer bags for future use if you’d like. 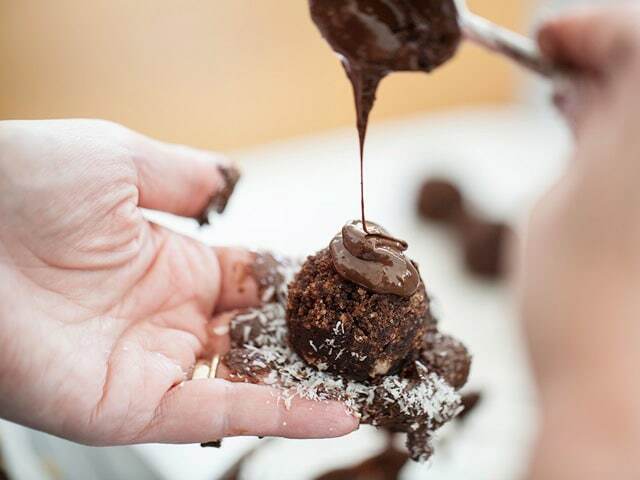 Remove cake balls from freezer and dip into the chocolate mixture or drizzle over the top. Place on a parchment covered baking sheet or platter. Refrigerate or freeze in an airtight container until ready to serve at room temperature. 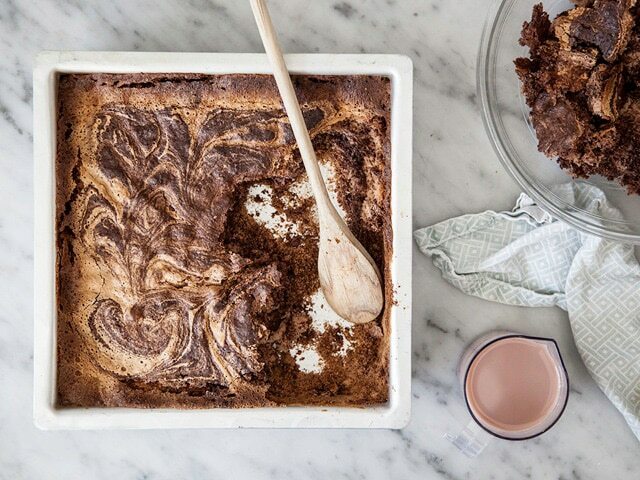 Note: This recipe is vegan and pareve when using a dairy-free marble cake mix (like Gefen) and dairy-free chocolate. Heidi used Elite bittersweet chocolate, which can be found with Passover certification. 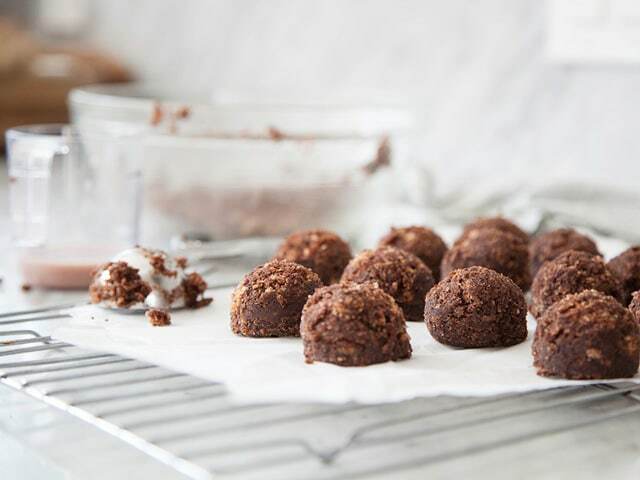 If you are looking for a special Passover hechsher and can't find a chocolate almond milk, blend together regular almond milk (store bought or homemade) with 1 tsp cocoa powder and 1 1/2 tsp sugar as a substitute. I did a test run of these over the weekend and they were amazing! Easy and so good. Can’t wait to make them for Seder this year. Beautiful Blanche. So sorry for your loss. Very happy the blog has brought you some comfort! 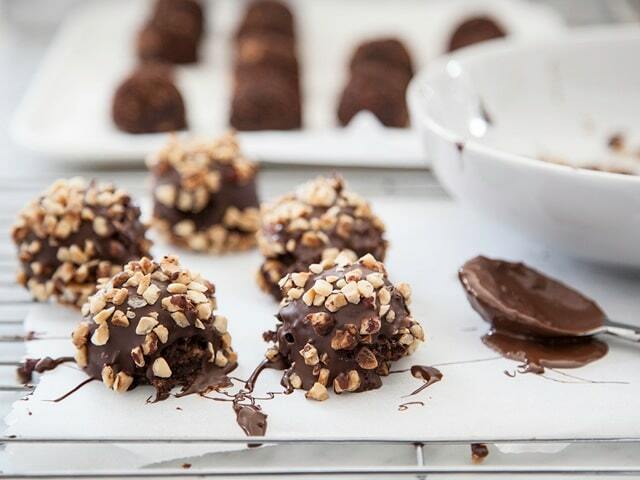 do you have a recipe for kosher for Passover truffles? Ooooh I can’t wait to make these!! Love Heidi at Foodie Crush.